Sweet or common basil (Ocimum basilicum) is a must to stuff your garden with over summer anywhere and everywhere you find a gap. When growing basil, there are many more varieties, but most have that lovely flavour and fragrance, a bit like spicy cloves. Originally from India and tropical Asia, Basil is especially loved by Italians and now popular everywhere. Legends abound: From 16th-century English botanist John Parkinson who wrote "fit for a king's house", to 17th-century French botanist Tournefort who sneeringly described unsavoury basil thus, "A certain Gentleman of Sienna, being wonderfully taken and delighted with the Smell of Basil, was wont very frequently to take the Powder of the dry Herb, and snuff it up his Nose; but in short Time, he'd turn'd mad and died; and his Head being opened by Surgeons, there was found a Nest of Scorpions in his Brain." Many cooks and bottle-washers... not forgetting gardeners, grow basil in a pot or two inside or outside. Basil is easy to grow, so a pot is fine and very handy to pluck a few leaves for flavor and garnish. Basil doesn't mind a crowd in a pot. Because you'll be snipping the plant a lot during growth, it's fine to plant 2-6 or so plants together. 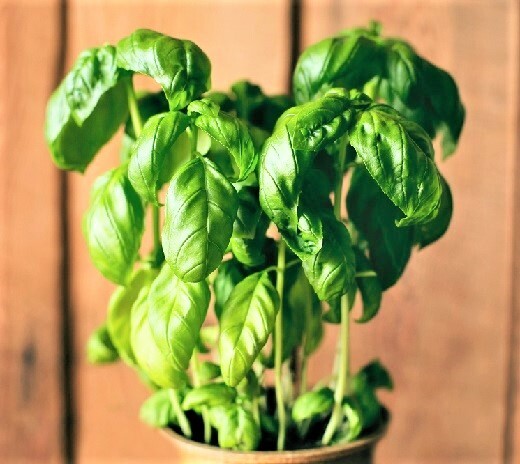 If growing basil in the garden and you want to pick a lot or have some handy on your windowsill, just cut a stem with leaves on, put stem in container of water and just take the leaves off to use, starting at the bottom. Keep at room temperature, not in fridge or cold, draughty place, as cold will make your cut basil go black and nasty. Basil loves warmth, at least 4 hours of daily sun, but prefers shade or semi-shade from long hours of searing sun. In autumn, particularly in wintery parts of the world, basil is likely to look rather sorry for itself, because it is a warmth-loving plant that won’t survive the cold. This means that although it is a 'perennial' and thus will live for years in warm areas if well fed and watered – in climates like most of the US and Western Europe, NZ and other temperate areas, it is usually treated as an 'annual' plant. This means it simply lives for just one season and the basil planting process happens again each and every spring. A general rule is that basil won't grow when temperatures hover around 10° and below. A sudden drop to 4° and under will send your plants into death throes quick smart. If going the annual route: simply plant your basil seeds each spring. Basil hates frost so sow seeds into pots indoors and plant outside after last frost. ... or move to a warm climate! It's worthwhile having a handy frost cloth or some protection to use with basil, because it's such a wimp if you suddenly get an early or late frost snap. There are three main cultivars of basil: Sweet Basil, the most popular for the kitchen; Purple Basil – gorgeously attractive, and Lemon Basil which has a slightly lemon flavor. They all grow like mad and need frequent picking of the growth shoots to stop legginess and flowering. There are many more basil cultivars, including dwarf and giant forms, and some with variegated leaves. Many are grown for their ornamental beauty, rather than used with food. 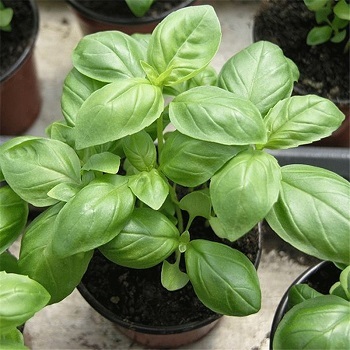 Sweet Basil: Grows tall and bushy, 50-75cm (18-30") high. Sharp, spicy flavour, and small white flowers. 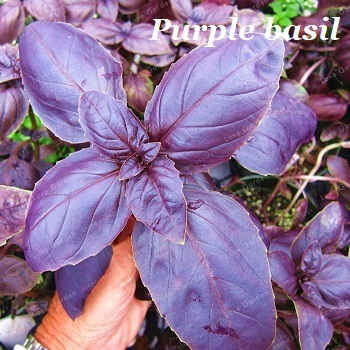 Purple Basil: Mild flavour and attractive dark purple leaves with mauve and white flowers. 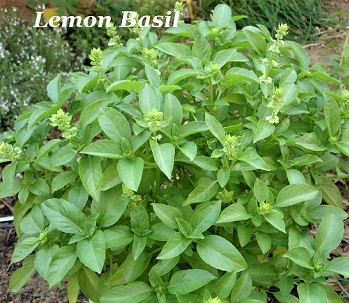 Lemon Basil: Strong lemon-scented leaves and white flowers. Bush basil: Compact and bushy, growing around 15-30cm (6-12") high. Small, shiny leaves and usually chosen as a pot variety. The list is endless, but more that come to mind (with self-explanatory names) are: Cinnamon basil—so good for cooking; Thai basil—sweetly peppery, perfect for curries and Thai and Vietnamese soups; Corsican basil—an heirloom with mottled green and purple leaves; Chocolate basil—guess! Clove basil—large plants, highly aromatic. Edible, but more often used in pot-pourri or toothpaste, mouthwash and the like. Lettuce leaf basil—very large, prolific, crinkly leaves used for pesto, and wrapping up stuffed food. Basil cuttings root easily in water. Strip off the large leaves when you take cutting, put them in some water in a container on a sunny windowsill, and little roots will poke out within a week or two. The water needs changing every few days to stop the stems rotting. You can plant out the cuttings once the roots are long enough, say about 2.5cm (1"). Don't leave it longer as you might damage the tender new roots and slow growth. Sow seeds either in pots inside, a greenhouse, or other warm place. If sowing in the garden, sow &frac18; to ¼ deep, about 2.5cm (1") apart. Cover with fine soil, water well and keep damp. Seeds start sprouting in 15 to 20 days. Once your seedlings are around 5cm (2") high, you can thin them so they are 21cm (8") apart. This will give space for really bushy basils, as long as you keep pinching out the shoots. Basil likes fertile soil with a neutral pH 6.9-8.0, and frequent watering. Don't let it dry out, but don't let them be soggy all the time. If grown in a pot, basil will need to be watered each day if it's hot. Strangely basil likes to be watered in the sun, unlike most plants. Give liquid organic fertilizer every 3 weeks during growing season. Start harvesting your basil when plants are 15cm (6") high. Pick the top 5cm (2") just above the leaf axils and watch them take off. Two more stems will grow out and as they produce leaves, keep snipping above the 1st or 2nd leaf node on each of those stems. Always snip stems, not just leaves. Keep your basil bushy and compact, don't let it go to flower and seed, or it will stop producing leaves. At the end of the season or earlier, it's fine to let one plant or more go to flowers if you want to attract bees or save some seeds. You can let the seeds scatter around, or you can save the seed. Really one or two basil plants, especially if in a big pot or in open garden, are enough to keep a family, and visitors, going all year. Japanese Beetles seem to be about the only pest that might appear and eat holes in basil's leaves. The best way to deal with this is for you to appear as well... in other words, pick these beetles off and keep at it every few hours if you can, and you should find they soon get the message and disappear. Cooks call basil a delicate herb, along with others such as chives, cilantro, mint, parsley and marjoram. To preserve their flavor, delicate herbs are best added in the last minute of cooking or sprinkled or stirred through food before serving. No Italian worth their basil, would serve up tomatoes without a sprinkling of basil. And you can add some delicious basil flowers to salads for a taste treat too. There's nothing to beat the flavour of fresh basil, but second best is having dried or frozen basil on hand for winter meals. Try and pick your basil mid-season for the best plumpness, flavor and nutrients. Many people simply chop the leaves and pack into ice-cube trays with olive oil or water, and freeze. Want to dry your basil leaves for later? Have a read here: How to dry herbs.